Corporate Wellness Services – A Healthy Balance, Inc.
We provide a full scope of custom-designed training and educational programs covering nutrition and healthy eating, tips to fitting in fitness and creating a workout routine, strategies for decreasing stress, workplace wellness hacks, healthy-but-easy recipes, smart snacking ideas, motivation and goal setting, injury prevention and safety guidelines, and tips to striking a work-life balance. See below for a detailed description of each of our Wellness Program Services. 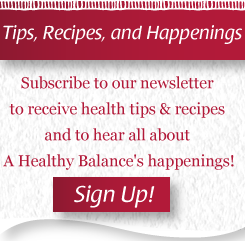 A Healthy Balance, Inc.’s monthly wellness newsletter, Healthy Bites, is designed to educate you on all things wellness. Each month we serve up a variety of health and wellness topics delivered directly to your team’s inbox. You’ll find health awareness articles, prevention guides, healthy-made-easy quick tips, nutrition and fitness myth busting, health how-to’s, wellness DIY, exercise demonstrations, health recommendations straight from the pros, easy to-make-recipes, and more. Wellness Wednesday emails are your teams’ weekly guide to making healthy easy, and keeping wellness at the forefront of your employee’s day to day lives. Wellness Wednesday Quick Tip emails keep your team healthy and balanced with quick tips and easy workplace wellness hacks delivered directly to their inbox. Our Wellness Questionnaire and Health Risk Assessment is designed to collect information on employee personal health habits, identify health risks across the organization, and gain insight into what your team is looking for in a wellness program. The questionnaire is quick and easy to complete online or a mobile device. Information is used to build a program focused on driving employee engagement, and positively impacting wellness trends on both an individual and organizational level. Employee individual responses and personal health information is kept confidential; aggregate results are shared with management through a password protected link. Management coaching and consulting throughout your program will ensure wellness goals and messages are understood and being carried out among your management team and staff leadership. We’ll work with you to promote wellness initiatives to employees, leverage existing wellness resources, collaborate with your broker or insurance carrier, consult on purchasing wellness products and workplace amenities, and offer insight on available program funding such as training grants and wellness tax credits. Our goal is to integrate all of these components into a comprehensive program to maximize your wellness ​investment. Wellness Solutions Packages include a Welcome To Wellness Kick-Off. This is an opportunity to introduce your organization’s specific wellness program, demonstrate Health-E: AHB’s Wellness Portal, and get your team excited about upcoming programs and events. Kick-Offs can be done on-site, virtually, or by campaign announcements. Each employee will receive a Welcome To Wellness email from A Healthy Balance, Inc. with an introduction to the program, a link to Health-E, information on how to register for programs, where to find wellness resources, how to contact AHB coaches, and how to set their wellness communication email preferences. Throughout the program new hires will receive a welcome email and employees will be informed periodically of program updates. A Healthy Balance, Inc.’s team-based challenges are designed to get employees actively engaged in their health and well-being through friendly competition. They provide the tools, education, and motivation to help participants create a foundation of healthy habits and to successfully fit exercise into their daily routine. All challenges are logged using Health-E: AHB’s Wellness Portal. The 30:30 Challenge is designed to motivate employees to take it past the minimum recommendation of 30 minutes of exercise a day 5 days of the week. We “challenge” them to step it up and get 30 minutes a day for 1 full month! 8 Weeks to Wellness combines a fitness challenge with building healthy lifestyle habits. Participants earn 1 point for every 10 minutes of exercise and are challenged to not only reach, but exceed the recommendation of 150 minutes per week! Weekly bonus challenges incorporating healthy eating habits, stress management, team building, and overall wellness will help participants build healthier lifestyle habits. A Healthy Balance, Inc.’s Healthy Cooking Demonstrations are presented by A Healthy Balance, Inc.’s team of food-loving Cooking Coaches and Registered Dietitians who combine a fun, engaging and interactive demonstration with a nutrition workshop, open Q&A, and of course samples of our delicious dishes! During our demonstrations we not only teach attendees how to make a healthy-but-easy recipe, but we give them time-saving food prep short cuts from the pros, cover basic cooking techniques, show how to scale a recipe, and talk easy swap outs to make dishes appeal to even the pickiest eater. Nutrition 365 is a nutrition and lifestyle program designed by a Registered Dietitian that focuses less on tallying calories, grams, and points and more on optimizing your eating habits for a healthy body and healthy life. Whether you’re looking to drop a few pounds, boost your energy level, lower your cholesterol, manage your blood sugar, finally learn how to read a food label, or are looking for tips and tricks to make healthy eating easier; this is the program for you! What does Nutrition 365 Include?